Girl and the Goat and Little Goat are among my favorite restaurants in Chicago. GATG is fancier while LG is more diner-style, but both have presented some amazing dishes. I stopped by both restaurants for dinner and dessert as a final indulgence on my last night before heading back to Columbus. Goat chili cheese fries. So good! It's gamey so it may not be for everyone, but I really like gamey dishes actually. Fat Elvis waffles with banana, peanut butter-butter, and bacon maple syrup. It's good, if you can't tell by the half-eaten pic. We dug in as soon as it landed on the table, and I forgot to take the pic at first because I was too busy fighting for a bite. I really dig the peanut butter-butter, which is pretty much peanut-infused butter. Really unique. Springy shrimp and pork belly, with pea shoots, white asparagus, and springy noodles. The flavors in this weren't unique, but I really liked all the fresh ingredients. The pork belly pieces were succulent and the shrimp were so plump. Forest Gump bread with pea butter and carrot butter. I wasn't a huge fan but that might've been because I was too full at this point to enjoy bread. Also it tasted very... rustic is how I would describe it. Miso-butterscotch budino with bacon toffee, glazed pineapples, and candied cashews. I ordered this dessert during my last visit too... ya it's that good. Green tea soba noodles with shrimp, tofu, bok choy, and thai chili soy vinaigrette. This dish was really great -- the shrimp were perfect and the vinaigrette had the best kick. It was a great light course to start the meal. House-made clam chowder. I believe this is one of their most popular. Something about it was different and I can't put my finger on it (maybe it had a touch of alcohol? ), but this is the best clam chowder that I've had. Oyster Po' Boy Sliders with kimchi and peanuts. The bread was so pillowy, the oysters were wonderfully crisp, and the kimchi paired surprisingly well with everything. This was my favorite thing of the night, and we considered getting a second batch but decided to refrain for dessert instead. Lemon panna cotta with strawberries, madeleines, and some kind of sorbet (rhubarb?). This is the most interesting presentation of panna cotta that I've tried, and I pretty much like most desserts that are creamy yet refreshing/fruity so I had to like this. I love summer -- we had school responsibilities this past week but they were chill, and I have research coming up but it's so much less stressful than the school year. Instead of studying on weekends, I get to cook, pig out, and then nap all day. My first project this summer is this recipe by David Lebovitz, as I've been an avid fan of his blog for years. The guy can cook and has incredible ice cream recipes, and you gotta admire a person who makes a living enjoying life. He used to be the pastry chef at Chez Panisse, then gave up everything to move to Paris but still has a crazy fan following in the US. It looks like all he does each day is cook/blog, write for his book, and give food tours to the rich and wealthy. What a life. I was reading a post on his blog about the making of his new book, My Paris Kitchen, and his photos of the caramel pork ribs made me realize that I needed to get my hands on that book so that I could attempt them myself asap. I finally gave it a shot, and wow. The flavors were Asian-inspired, which was surprising, but crazy delicious as expected. We bought three racks of ribs at Costco and used one rack for this recipe, which we cut into 3-rib sections. Costco sells the freshest, highest quality ribs that I've found anywhere. I froze the other two racks and have big plans for them soon puahaha. Preheat oven to 350F. Over the stove, add your regular sugar to your dutch oven and caramelize the sugar over medium heat. I added a bit of water to moisten the sugar, since I find it easier to caramelize sugar without burning it in this way while yielding the same results. Continue to heat the sugar until it becomes a deep copper colored liquid (be careful not to burn it! ), then remove from heat and stir in your brown sugar. Add the beer. 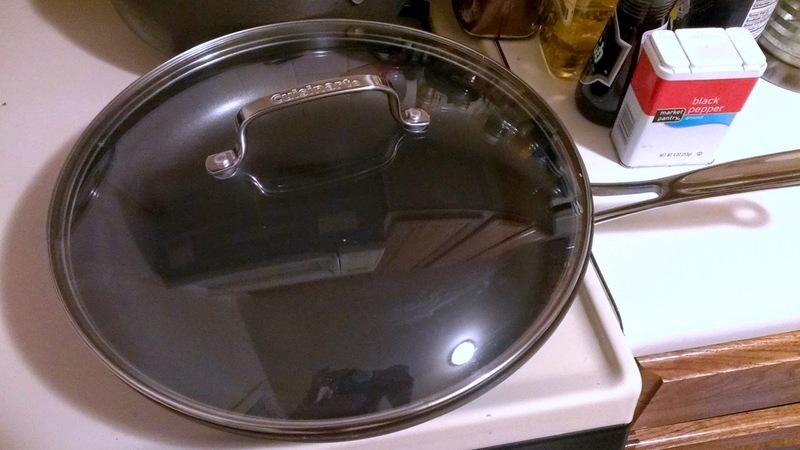 This step is exciting since it reacts violently and the caramel will seize up, so be careful. Turn the stove to low heat. Add bourbon, cider vinegar, ketchup, ginger, soy sauce, Sriracha (or another hot sauce), dijon, and black pepper. Add your ribs (don't worry if they're not completely submerged by the sauce), turn up the heat, and cook until the sauce heats up and bubbles, then transfer the pot to the oven. Let it roast with the lid on for 1.5-2 hours, flipping the ribs every 30 minutes or so, then remove the lid and let it roast for 30 more minutes at the end to thicken the juices. For the dressing, combine mayo, vinegar, minced garlic, Dijon, and black pepper (I garnished with a bit of parsley as well). I had planned to make this meal a couple days earlier, so I had the dressing premade already and it sat in the fridge for a couple days. I think that letting it sit in the fridge helped the garlic permeate throughout the dressing, and allowed the flavors to meld. For the veg, I sliced up red cabbage, carrots, avocados, apples, and hard-boiled eggs, then added parsley and green onions. When the ribs were almost done roasting in the oven, I tossed the slaw with the dressing. Ribs, fresh out of the oven, oh my golly. Plated (on my gorgeous new plates!). I devoured this and a second helping, followed by the most lovely food coma-induced cat nap. Hooray. Porchetta pizza! 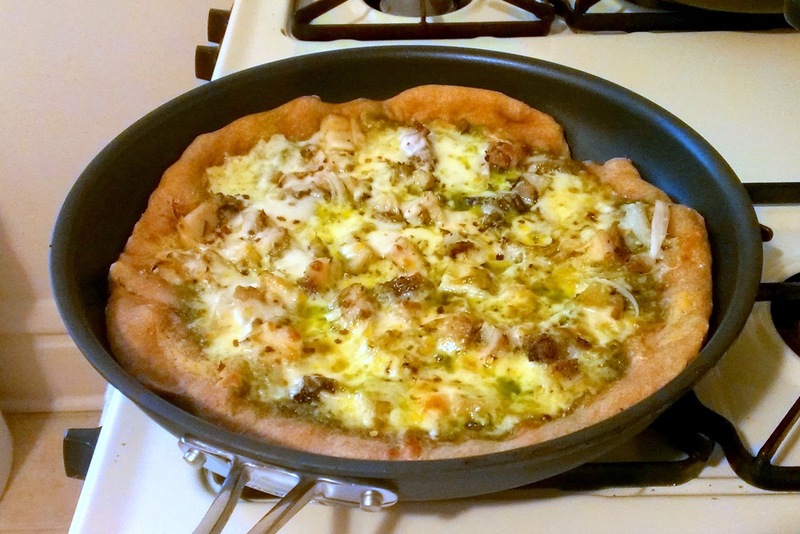 I had some leftover porchetta and salsa verde, so I loosely followed this recipe but used Trader Joe's whole wheat pizza dough and added caramelized onions. It turned out amazing since the pork belly pieces made it crazy juicy. I split this 12" pizza with my roomie and we each ate it for two meals because it's so fatty and filling, but incredible. Khoi's pho! The broth was wonderful -- very flavorful, even without sriracha/ hoisin. 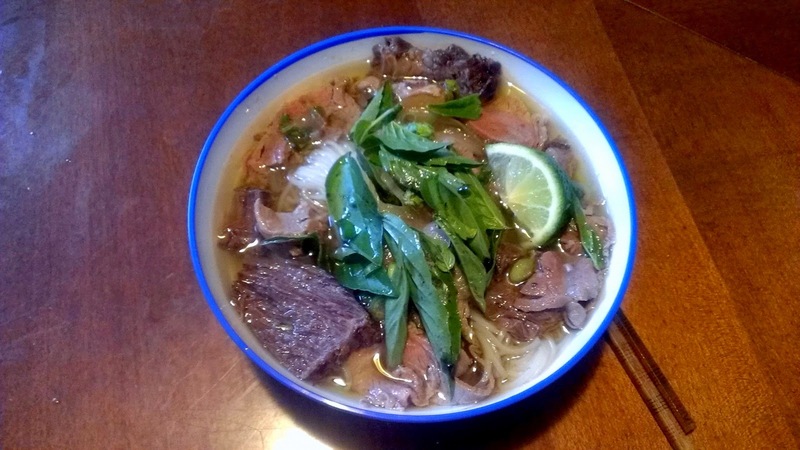 Homemade pho done right is so much better than restaurant pho. 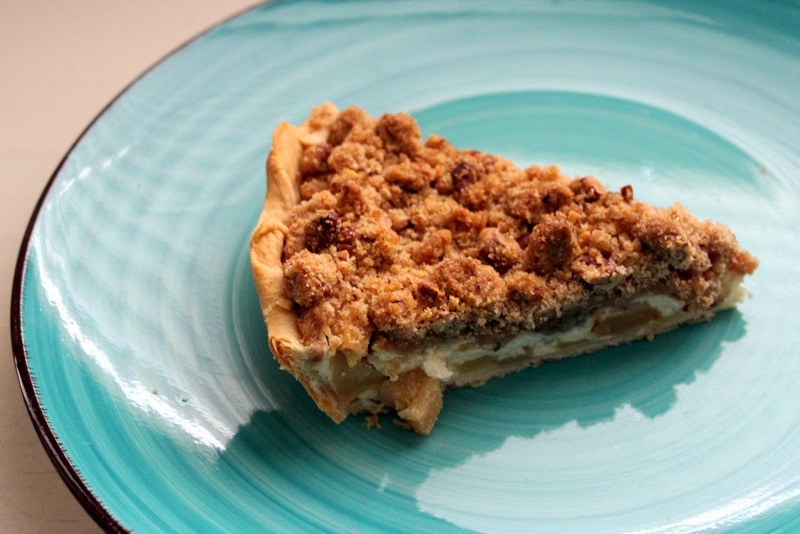 Dutch Apple Pie with Sour Cream Custard - recipe from The Hoosier Mama Cookbook. Hoosier Mama is a highly rated bakery in Chicago that recently published its own cookbook, so I had to see what all the fuss is about. Unfortunately, I was underwhelmed since it was too sweet, even when I cut the streusal recipe in half. 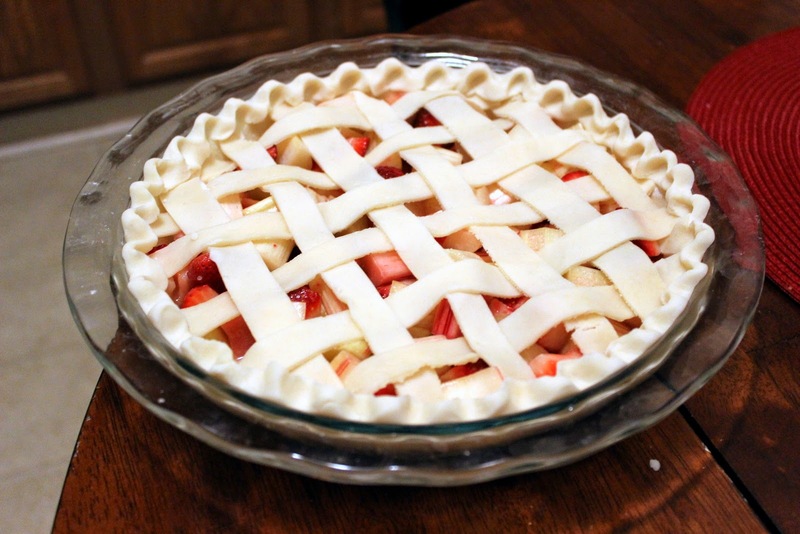 Strawberry Rhubarb Pie, also from The Hooiser Mama Cookbook. It was also too sweet for me, but much better than the dutch apple pie. I served it a la mode at a friend's barbecue and it was quickly gone. 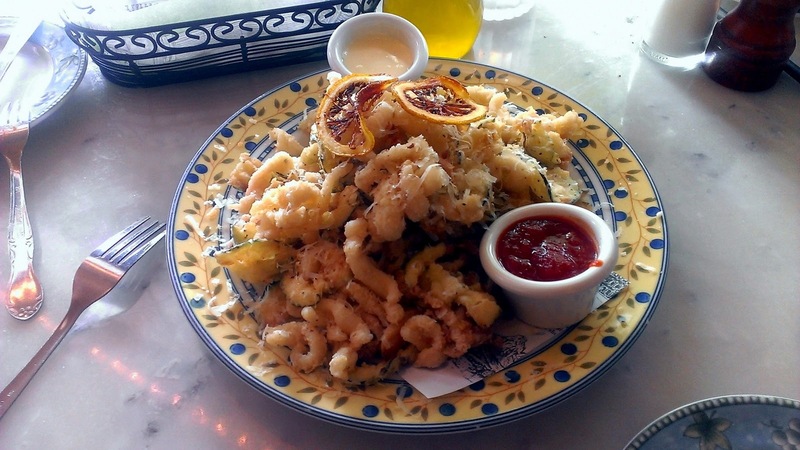 Calamari from Marcella's. I came here for happy hour, which featured half off of all apps/ pizzas/ drinks, and this was my favorite. Only $7 for a huge platter of perfectly crisp calamari, so yums. 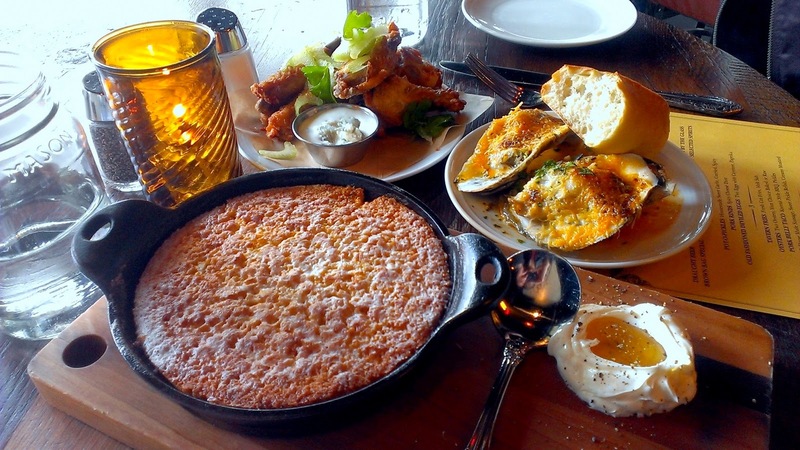 Happy hour at The Pearl: parmesan baked oysters, confit chicken wings, and corn jalapeno spoon bread. I'm convinced that they have the best happy hour in Columbus. 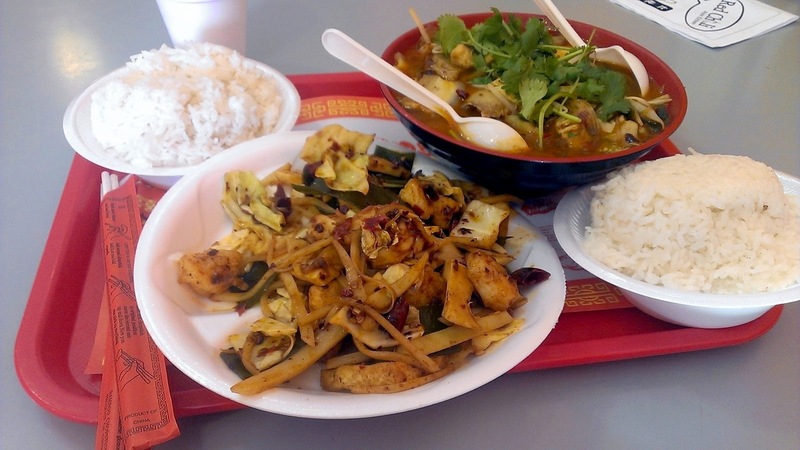 Hot and numbing wok fried shrimp and Szechuan hot pot with fish at Red Chili Asian Kitchen. It was a hot day and I was sweating profusely because of those dishes. I'm surprised at how authentic it tasted, and love the proximity of this restaurant to campus. 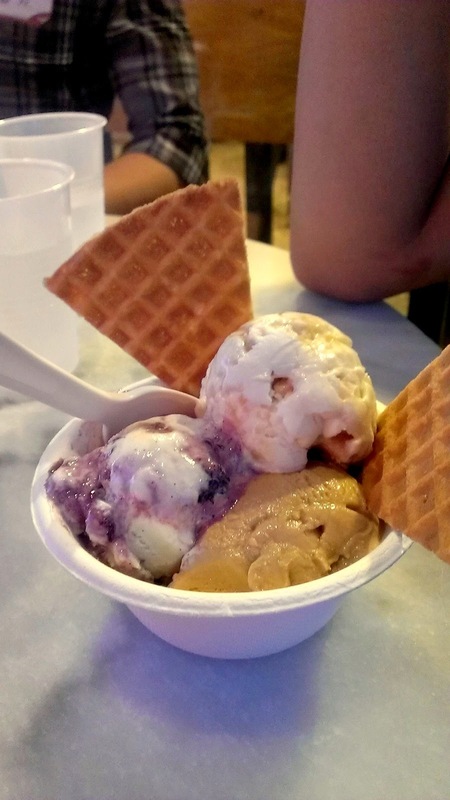 Brambleberry crisp, salty caramel, and brown butter almond brittle from Jeni's, because ice cream season means Jeni's season. I can make a lot of their recipes from the cookbook, but it's not the same as polishing off a large sundae on a hot summer day outside of a Jeni's store. Coolass decor from an awesome shop I recently discovered on the Short North called Global Gallery. 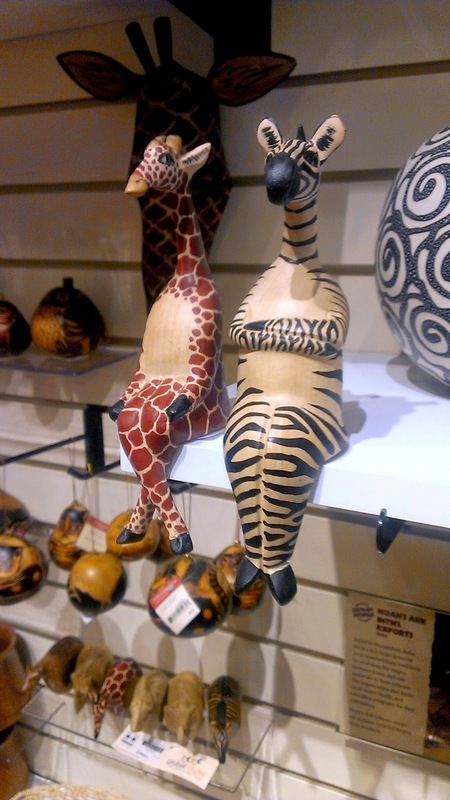 They're nonprofit, all their wares are fair trade, profits go towards a good cause, and they have the coolest trinkets. I wanted everything. Hopefully I'll be able to cook and post even more this summer, cheers!